The Boston Red Sox celebrating for their World Series win. The Red Sox, for the fourth time, are champions. 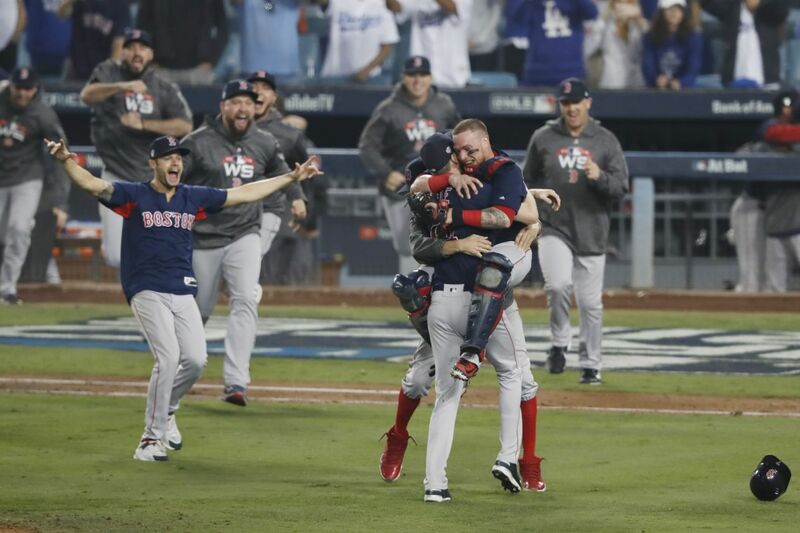 At Dodger Stadium, the Boston Red Sox, playing against the Los Angeles Dodgers, won the World Series Championship 5-1 on Oct. 28, 2018. For 86 years, the Red Sox had not won a single World Series Championship since 1918, but in 2004, they broke their unlucky streak. Since then, the Red Sox have won the World Series in 2007, 2013, and now in 2018. Chris Sale, a pitcher for the Red Sox who pitched in the 9th inning, struck out Justin Turner, a third baseman for LA Dodgers. Sale started to worry Boston fans when Enrique Hernandez, a utility player for the Dodgers, was up 3-1. In the end, Sale made a turn around by striking out Manny Machado on the fourth pitch.